If you’ve been in the online business for a while, you surely know Russell Brunson already. He’s the guy that popularized the genius concept behind funnels. He got directly mentored by copywriting legend Dan Kennedy, and over time has built a $ 100+ millions a month business called Clickfunnels. 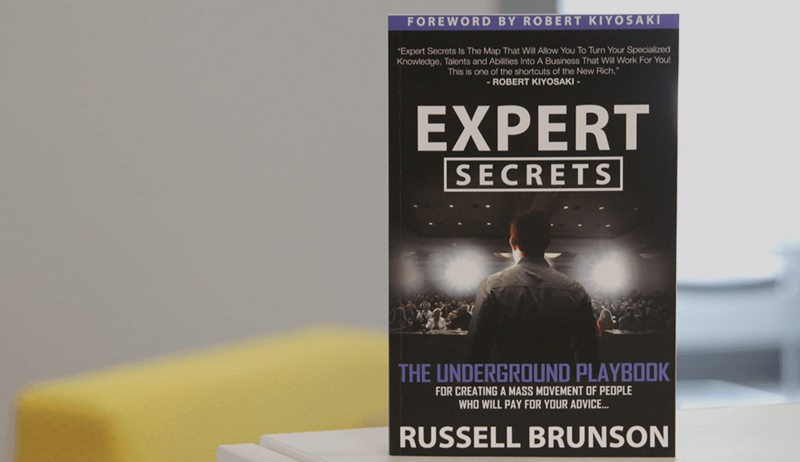 The latest book Russell released it’s called Expert Secrets. I will tell you more in this review about why I believe it’s a must read for everyone who has or would like to start an online business based selling anything, from digital to physical products, coaching or consulting. What’s ‘Expert Secrets’ All About? Expert Secrets is all about creating your following. How do you do this? By becoming an expert and coming up with a message that can change someone else’s life. But this is not just helped for those who aim at selling info products, consulting or coaching, thought the book it’s dedicated to them. With consolidation happening in the market, in 2019 many physical product sellers who have made a fortune in the past years by just importing products for cheap in China and reselling them on Amazon for products, are seeing diminishing returns from the continuous process of launching new products which have no differentiation from the others on the marketplace. Outranking who has already many reviews, it’s getting harder and harder. It seems like the good old times are gone. It seems like everyone started to obsess about the importance of growing a brand behind your physical products. There are countless examples of brands that came out of nowhere and made it big. Dave Asprey launched Bulletproof Coffee (COFFEE!!) and built an entire multi-million dollars brand publishing hundreds of blog posts and podcasts. Abrey Marcus crushed it in the hyper-competitive supplements niche leveraging influencers which had already an audience like Joe Rogan. Quest Nutrition got acquired after they’ve posted recipes and built a following in the low-carb niche and Tom Bilyeu became a star in the entrepreneurship world. The problem is, how can you achieve similar results? Well, it’s all in Expert Secrets. It touched every aspect that all these brands like Quest and Bulletproof have: a great character, a story, and other points that will differentiate your brand from the others, etc. The first part of the book it’s all about the psychology behind building a mass audience around your brand and products. Russell has found that all mass movements have three things in common. They each offer their audience a new opportunity. The second aspect touched by Expert Secrets it’s about how to define your niche, your group of people and community that you want to aim to. At least when you’re beginning, the author suggests you focus on a micro-niche of a particular market. By doing this, you will not have to target many people which can result in confusing in your message and more expansive in your cost per acquisition of your customers. People want leaders to follow, and you’re exactly the person that it’s going to lead them to a better future. If you know more than others, and most importantly you’ve overcome the issues that these people are having, guess what? You’re an expert for those who haven’t! You can serve your customers to help them reach the life and future they crave for, and get well-paid in the meanwhile. Live the life that your audience wants to live. To be believable you need to show that you are living the results you are selling. Don’t be boring. Don’t be mainstream, be prolific, but not crazy. Understand how to use persuasion. Encourage their dreams, justify their failures, allay their fears, confirm their suspicions and help them throw rocks at their enemies. Care a Lot. “They don’t care how much you know until they know how much you care“. Maintain absolute certainty. When you start, you are writing for YOU not your audience yet. You are finding your voice and improving your skills. Be a Giver not a Taker. It’s all about creating value for others. Click the image below to grab your copy of Expert Secrets for FREE + shipping. Previous Post Plutio Review: Can it Really Manage Your Entire Business? Next Post Lemlist Review – Is It the Ultimate Email Outreach Tool?